Enrollment in the Choice Scholarship Program for 2017-18. The report by Notre Dame and University of Kentucky researchers found test scores of these students’ never recovered after they lost ground when transferring to a private school. “And even by years three and four down the road, they’ve still experience an achievement loss relative to where they started in public schools and in comparison to their public school peers,” co-author R. Joseph Waddington of the University of Kentucky told WFYI News Friday. 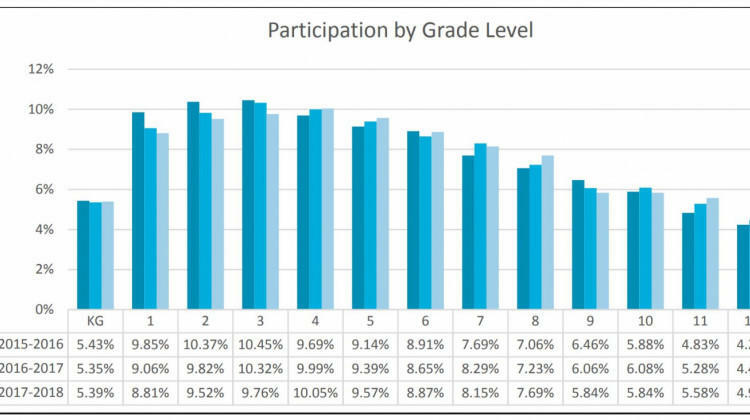 In English/language arts, these same students had no benefit in achievement based on test scores after they switched to a private school from a public one, accord to the multi-year study. The findings are likely to be met with praise by voucher critics and skepticism by supporters. In Indiana, the debate over the private school program has continued since lawmakers created the program in 2011. It's been considered a possible template for President Donald Trump’s previously mentioned plan to create a nationwide program. “Our results do not provide robust support that (Indiana’s voucher program) has been successful to date at improving student achievement for low-income students who use a voucher to switch from a public to a private school,” Waddington and Mark Berends of the University of Notre Dame write in the paper. The study looks at around 3,300 low-income students in grades 3-8 who used a voucher to switch from their public school to a private school in 2011-12, the first year of Indiana’s voucher program. The study did not look at voucher students who never attended a public school which makes up the majority of the program. Today more than 35,000 students used a voucher to attend a private school at a cost of $153 million. “So what we hope that people use this as a perhaps a cautionary tale but realize that there are other questions that need to be asked before you know putting the nail in the coffin of your programs,” Berends told WFYI News Friday. The researchers will continue studying Indiana’s voucher program. They say an understanding of non-academic outcomes, such as college attainment or social and emotional learning, are needed to more fully assess the program. Last summer Waddington Berends released early findings on Indiana’s Choice Scholarship Program as they were undergoing final peer reviews. Since then, they say, they’ve cleaned the data and altered some approaches in the analysis. The early results last year, first reported by NPR, found students regained the ground lost in math if they remained in a private school for three or four years. But the final report out now in the Journal of Policy Analysis and Management adjusted those findings. In a 2017 investigation, NPR found some private schools turning away children with disabilities and LGBTQ students who qualified for the voucher program. The Indiana State Board of Education approved four private schools with a history of low performance and academic failure to accept publicly funded vouchers to cover tuition for incoming students during a meeting Wednesday. The schools had lost their ability to enroll new students in the Choice Scholarship Program because they had been rated a D or F on the state’s accountability system for at least two consecutive years. U.S. Secretary of Education Betsy DeVos visited a high-performing private Indianapolis high school Tuesday, where nearly every student receives a voucher. She toured Providence Cristo Rey High School on a fact-finding mission and meet students and staff. 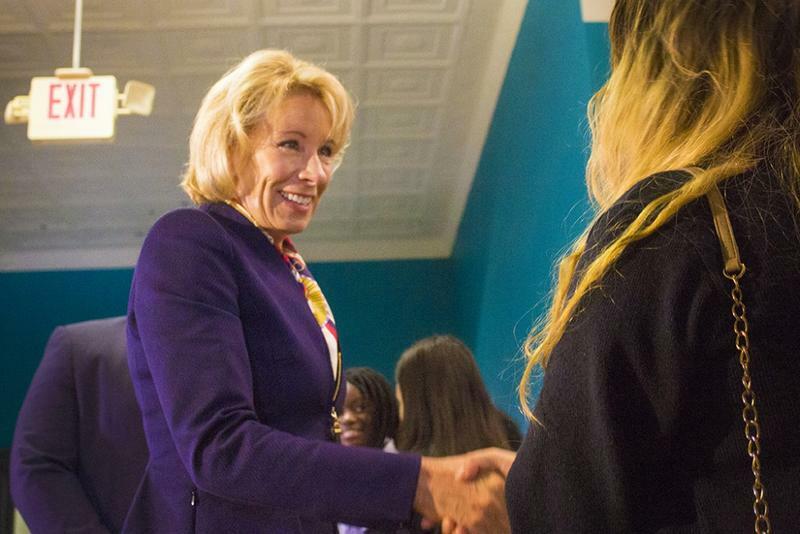 DeVos’ school visit follows a Monday speech in Indianapolis where she alluded to “an ambitious” federal expansion of school choice. DeVos did not lay out details of what a federal program could look like. The state-funded preschool pilot program that began with five counties was expanded during the 2017 legislative session for 15 more counties. Now, parents in 10 of those counties can apply for half-year preschool. But all low-income families applying will also have to comply with a new program requirement. A state grant would pay for half or full day preschool for a 4-year-old child beginning next January.